This is the best book on Apollo that I have read. Extensively researched and meticulously accurate, it successfully traces not only the technical highlights of the program but also the contributions of the extraordinary people who made it possible. --Mike Collins, Command module pilot, Apollo 11For the 50th anniversary, the epic story of Apollo 11 and the astronauts, flight controllers, and engineers who made it happen, by the author of the bestselling A Terrible Glory and The Blood of Heroes.On July 20, 1969, Neil Armstrong and Buzz Aldrin became the first humans to walk on the Moon, a moment forever ingrained in history. Perhaps the world's greatest technological achievement-and a triumph of American spirit and ingenuity-the Apollo 11 mission, and the entire Apollo program, was a mammoth undertaking involving more than 410,000 men and women dedicated to putting a man on the Moon and winning the Space Race against the Soviets. Seen through the eyes of the those who lived it, Shoot for the Moon reveals the dangers, the challenges, and the sheer determination that defined not only Apollo 11, but also the Mercury and Gemini missions that made it possible. 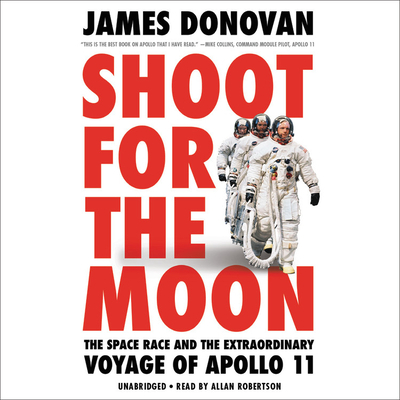 Both sweeping and intimate, and based on exhaustive research and dozens of fresh interviews, bestselling author James Donovan's Shoot for the Moon is the definitive and thrilling account of one of humankind's most extraordinary feats of exploration.